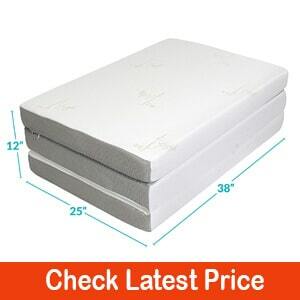 If you want to have a comfortable sleep even with limited space at home, you need to have the best folding memory foam mattress. Choosing the right product, however, will not be an easy task. Read this buying guide and we’ll help you to easily make the right choice. Tips For Taking Care of Your Folding Memory Foam Mattress. In this section, we will identify five of the best options that you can find in the market, as well as a few of their pros and cons. 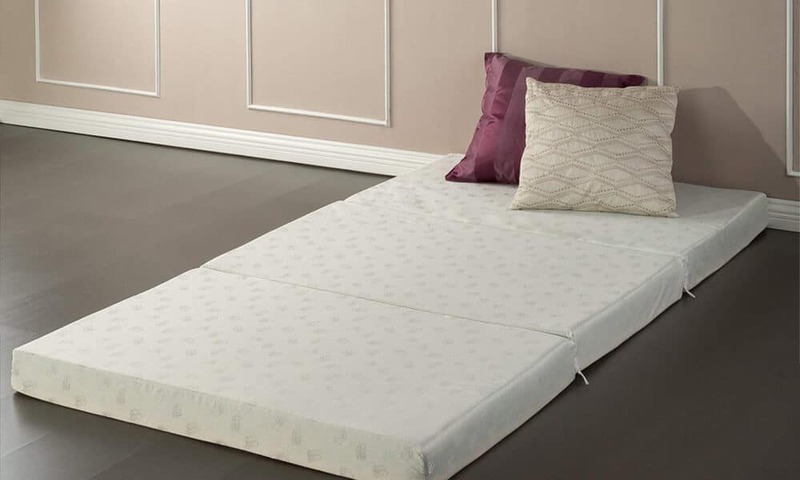 This folding mattress is made from a combination of 1.5-inch memory foam on the top and 4.5-inch high-density foam in the bottom. Although this is not purely memory foam, the combination of the two materials may work well in offering better air circulation. It comes with a jacquard ultra-soft cover that is made from bamboo cover. It is soft and will not irritate the skin. It is also removable and washable, making it easy to maintain its cleanliness. 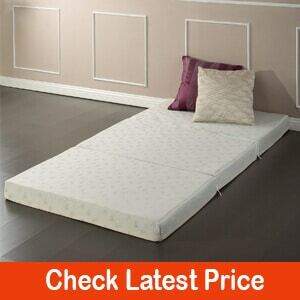 The design of the bottom part of this folding memory foam mattress is another thing that you might like. It is made to be non-slip, which means that it will be stable on the floor, regardless of the toss and turns that you make in your sleep. Because it is a tri-fold foam, it can also be versatile. When it is folded, it is high enough that makes it also functional as a soft seat. The thin size of this mattress, which is only 3-inches, would mean that it will be easy to bring it outside of your home. When it is folded, it will also take minimal space in the storage room. However, because it is thin, it may not be as supportive as its thicker counterparts. It should be noted that this folding mattress is not made from pure memory foam. There is a 2-inch foam in the bottom and a 1-inch gel memory foam at the top. This is better than a traditional memory foam because it can keep you cool throughout your sleep. If you want to have peace of mind, it also helps to know that this is CertiPUR US-certified. The latter means that it has been tested and proven to be free from toxic chemicals, giving you an assurance of its safety. Looking for a comfortable sleep with a portable and foldable bed? This is one option that you might want to consider. Its sleeping area measures 78x38x4 inches. On the other hand, once it is folded, its size is significantly reduced to 38x26x12 inches, making it space-efficient. This mattress has a thickness of 4 inches and is made from four pounds of foam. It has CertiPUR US certification, which can provide you with peace of mind, knowing that it is free from toxic chemicals. It is safe even for children. For added comfort, you might also like the inclusion of an ultra-soft bamboo cover. This is unlike other covers that can be too rough for a sleeping surface. Tired of experiencing body pain in the morning? This is one product that you might want to have in the bedroom. 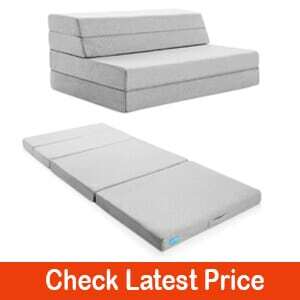 This is supportive and comfortable, which will make it a great sleeping surface, even if you have a small space. This folding mattress is made from 1-inch memory foam, 2-inch Visco-Later responsive foam, and 1-inch high-density foam as the base. The combination of these materials makes it thick and plush. When it is folded, it can also be multipurpose as you can use it as a soft chair. 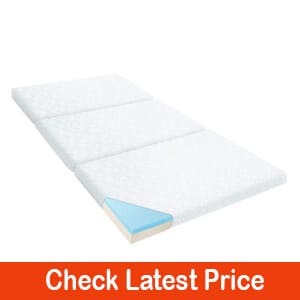 The CertiPUR US Certification of this foam is another thing that you might like. This only goes to show that it has passed stringent quality control. This certification is issued only to products that are made using non-toxic and safe materials. If you are looking for a multipurpose product, this is one option you might want to consider. Aside from being a mattress, it can also be used as a chair. When it is folded, the top will function as a comfortable backrest. In terms of portability, this can also be impressive. It is not only lightweight and compact, but it is also designed with a carry handle, which will make it easy to bring the foam anywhere. You might also love the fact that it is easy to clean and maintain. The cover can be removed in a snap and it is also machine-washable. Lastly, it has CertiPUR US certification, which is one thing that can give you peace of mind. It has been independently tested to guarantee its performance and durability. This will also provide you with an assurance of its safety. 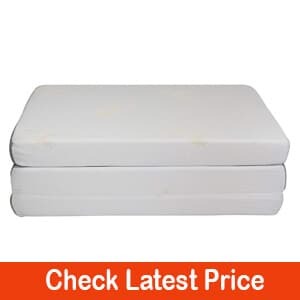 The therapeutic quality of this folding memory foam mattress is one thing that you might like about the product. It is soft and it can provide customized comfort, regardless of turning in your sleep. The plush surface can be retained even after long-term use. To provide the best bang for the buck, you might also like this because it is already inclusive of a bamboo cover. This is an eco-friendly and breathable material, which will lessen the tendency that you will sweat in your sleep. Lastly, it has a thickness of four inches and it is made from three pounds of foam. The high-density will make sure that it will not easily go flat. Even after several years, you can expect that it will be able to retain its shape. You can also use this type of mattress in more ways than one. For instance, if it is high enough when folded, it can double as a seat. It can also be used as an ottoman. Is it going to be used by one person or two people? How much space is available in the bedroom? You can choose from queen (60x80 inches), twin (38x75 inches), and king (76x80 inches), among other sizes. Choose a mattress that already comes with a cover, which will protect it from external elements and will make it last longer. A soft and comfortable material will be best, such as cotton. There are also some that are waterproof. 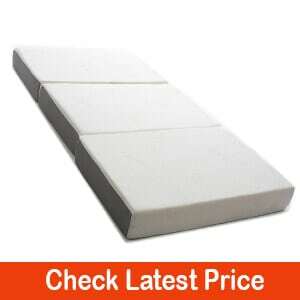 A thick memory foam is preferred because it is tantamount to its durability. This means that it will most probably take a long time before it goes flat. Thicker foams, however, can be less portable. Make sure that the memory foam will encourage proper air circulation. This will minimize the tendency that you will wake up in the middle of the night soaked with your own sweat. This is important to have a comfortable sleep. Choose one that is easy to transport, especially if you intend to use it outside of your home. It should be thin and lightweight. This will allow you to easily bring it to the campsite or wherever you need a comfortable sleeping surface. If you are having a hard time figuring out how one product is different from the other, you can go online and read reviews. The experiences of other people will make it easier for you to narrow down your choices. Most of the models available can be folded two or three times. Tri-fold mattresses can be bulkier, but it is a good thing that they can also be taller, which will make it double as a plush seat. With too many options for the best folding memory foam mattress, you might end up being overwhelmed. However, this should not be a reason for you to decide in haste or pick the product with the cheapest price. You must do your research to differentiate the possibilities (Source). 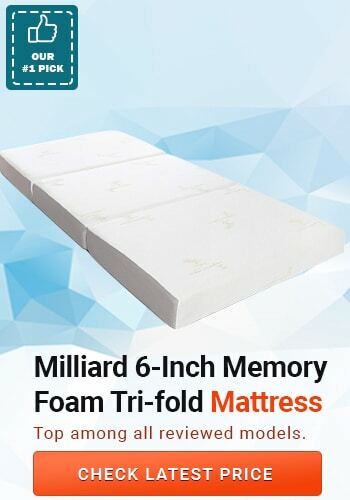 From the six products mentioned above, if there is one that I can personally recommend, it would be Milliard 6-inch Memory Foam Tri-Fold Mattress. From comfort to durability, portability to versatility, this can provide the best value for money, guaranteeing a comfortable sleep.